As I explained in the first of this series, I’m documenting my efforts to extract every editorial published in the Sydney Morning Herald in 1913 from the Trove newspaper database. It’s an experiment both in text mining and historical writing — an attempt to put the method up front. While I didn’t think there was anything very thrilling in the first instalment, recording my thoughts and assumptions in this way has already proved useful. In a comment, Owen Stephens noted that his attempt to reproduce my search query produced fewer results. After a little bit of poking around I realised that the fulltext modifier, which I often use to switch off fuzzy matching, counteracts the ‘search headings only’ flag. So my query was returning results that had the string ‘The Sydney Morning Herald’ anywhere in the article. 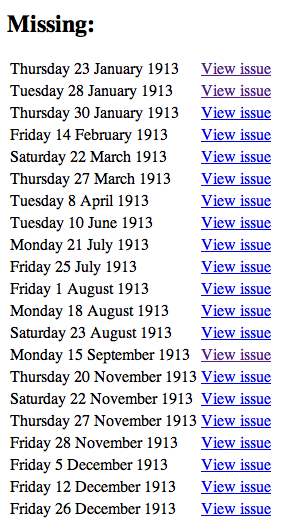 Here’s my original query — searching for fulltext:”The Sydney Morning Herald” in headings only (supposedly). You’ll notice that it returns 335 results and it’s clear from a quick scan that a number are false positives (they don’t follow the pattern for editorials). 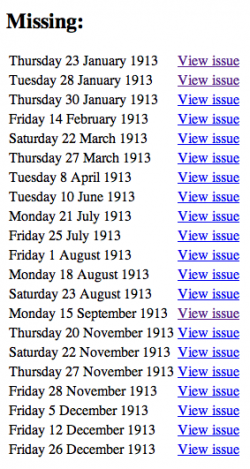 Here’s Owen’s query — searching for “The Sydney Morning Herald” in headings only. It returns 294 results, without any obvious false positives. So my attempt to disable fuzzy matching actually produced a less accurate result! Weird. Actually, I think one important benefit of this sort of text mining is that it helps you understand how the search engines you’re using actually work. Once you start poking and prodding, the idiosyncrasies start to emerge. Anyway, I harvested Owen’s cleaner result set and opened up the resulting csv file. As it seemed in Trove, there we’re very few false positives. Indeed there were only two articles that didn’t seem to follow the standard editorial format, and these were notes added to the editorial page. On the other hand, there were obviously about 20 editorials missing. I could have manually worked through the csv file to identify the missing dates, but I thought I’d try to create some tools that would do the work for me. Check a list for suplicate values. Returns a list of the duplicates. Finding missing dates was a little more complicated, but Google came to the rescue with some handy code samples. All I had to do was set a start and end date (in this case 1 January 1913 and 31 December 1913) and create a timedelta object equal to a day. Then it’s just a matter of adding the timedelta to the start date, comparing the new date to the dates extracted from the csv file, and continuing on until you hit the end. If the new date isn’t in the csv file, then it gets added to the missing list. # If not, add to the missing_dates list. I’ve tried to make the code as reusable as possible, so you can either supply a year, or the script will read start and end dates from the csv file itself. All that left me with two more lists of dates: ‘duplicates’ and ‘missing’. At first I just wrote these out to a text file, but then I decided it would be useful to write the results to an html page. That way I could add links that would take me to the actual issue within Trove, helping me to quickly find the missing editorial. Unfortunately there’s no direct way to go from a date to an issue — you first need to find the issue identifier. How do you do this? If you dig around in the code beneath the page for each newspaper title, you’ll find that the ajax interface pulls in a json file with issue information. You can access this through a url like: http://trove.nla.gov.au/ndp/del/titlesOverDates/[year]/[month]. Here’s an example for January 1913. Gets the issue url given a title and date. Finally, to save myself having to cut and paste the missing dates back into the csv file, I added a few lines to write them in automatically. So now I have a handy little html page, complete with dates and links, that I’m working through to find all the missing editorials. All I need for the next stage are the urls for the editorial and the page on which it’s published. I’m just cutting and pasting these from the citation box in Trove into the csv file. Once this is done I can start trying to find all the editorials.